Apart from the slightly stressful sounding application, this foundation sounds perfect. I've been looking for one that enhances my skin, rather than covering it completely- would you say this is the ticket? Love the bag, very cute. Jelous of the tempreatures in Dubai too. This post has me so excited for summer & finding the perfect white dress! (Meanwhile there's still snow on the ground here in Toronto LOL). The finish of the foundation sounds amazing - but what a pain to mix it so thoroughly before application! I love Fleur Power blush :) you should try Dainty too. I think I have Dainty back in the UK - nothing like a blush that brightens...love! I didn't know that but I can tell you that it's totally true :) Yellow is probably my favourite colour because it makes me happy.....I am just paranoid about getting this bag dirty! That dress is so cute! I'm determined to find the perfect white summer dress this year so I'm on the hunt as well. That bag is just gorgeous! And from the review I just read I will not be purchasing that foundation haha sounds like too much work and kind of scary to be honest! Ha, ha .. bum exposure (that was funny). I know exactly what you mean - especially when are are talking about early in the morning! Thanks for the foundation review and more importantly the instructions! I need to follow them, because I think I use too much too and I've never drained the dropper first. DUH! Have a wonderful day! laura! you look amazing as usual, and your natural skin tone, honestly doesn't need any fake tan! i am in love with your sunshine bag! i have recently hunted mini luggage in fluro pink after searching for it for a year! cannot wait for a little bit of sunshine so i can take her out :) i am so tempted for yours as well, i am trying to convince myself that i dont need it, well my bank account is quite convinced but i am still not :) have a nice day gorgeous! I loveeee Fleur Power! x And love the dress in this ootd, so sad it is about to retire. Thanks for the foundation review, Laura. It seems really finicky to deal with though... I am far too lazy for all those steps! Lovely dress! I'm super jealous that you can wear dresses and heels! Meanwhile, here I am staring out the window at the snow... I was curious about this foundation, but now it just seems like too much work! Looks lovely on you though! Sounds like the look of the foundation is worth a little shake! Thanks for the tips. It's definitely a lovely natural finish....mind you I tried another one this week that knocks this out the water...By Terry Cover Expert. That is seriously WOW! :) It's a super pretty classic blush - hope you like it! I JUST posted a review of this foundation on my blog. I love it so much - I can't stop raving to friends about it. The yellow Celine is the icing on the cake! I have very dry skin so unfortunately, I'm going to have to give this a miss! I do love your outfit though - love the (ready to cringe) "pop" of colour you have going on with the bag! No I completely understand - hassle in the morning is not a good thing :) I tried By Terry Cover Expert this week and it's really slap and go...that might be a better product. That bag makes me want to cry it's so pretty. Thanks for the mini foundation review, the formula sounds so interesting! 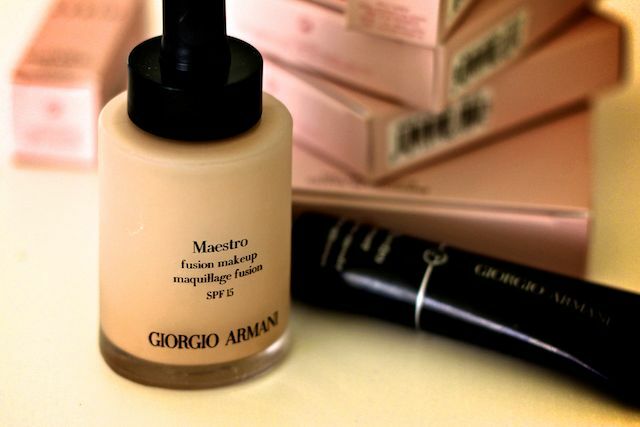 I really want to try some Giorgio Armana products, my friend has one of their matte Lip Maestros and it is AMAZING! Thank you so much for reading/saying that Rosina! haha I see your point! :) can't go wrong with a Celine - I absolutely love the style and still havent got sick of it! 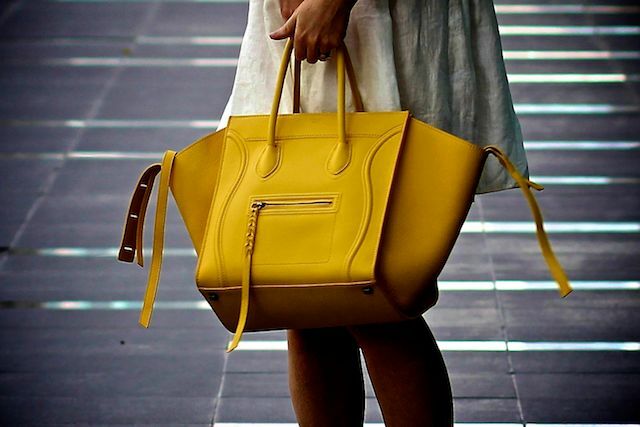 This bright yellow Celine Bag is quite charming. :) It's pretty good .... but I was naughty and bought another one this week and I love it so much more (if I am honest)...By Terry Cover Expert. It's wow! Hi laura, what colour is the armani concealer you use? Thanks! How have you liked the SK-ii essence?? Five reasons to get yourself down to Céline: Not everyone knows about it yet: In typically understated fashion there’s been little fanfare about the opening from the label itsel celineukstore.co.uk ,yeah?